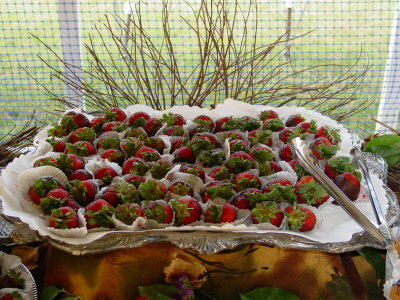 Desserts Full Service menus, Cutting Edge Catering, Catering to your every Whim! Serving Joilet and the entire Chicagoland area! End Your Meal with some Sweet Sensations. buttery caramel & dark semi-sweet chocolate chips. Drizzled with Chocolate, Original Rice Krispies & Cocoa Krispies. Oatmeal Raisin Cookies surrounding Fudge Brownies & Banana Cakes. Tuxedo, Cappuccino, Vanilla, Lemon & Chocolate Chip. Watermelon attractively displayed & garnished with Grapes. Dip Choice: Kahlua, Amaretto, Strawberry or Carmel Cream. Choice of: Basket, Whale, Carriage or Peacock. Assortment of Banana Cake, German Chocolate Cake & Carrot Cake. All dressed up for the party with candies, colored chocolate shavings & decor.